The most of the business people might come to a decision to have a website for their business. In the modern world we can’t help but imagine a successful businessman without having at least a small web page. No doubt that websites are the most effective and really working way for people to increase their incomes and get their businesses thriving rapidly. Once you have decided upon creating a site, you’ll have to choose one of two options: hire a professional development team or at least one person who is proficient in the web development field or build a website singlehandedly. The first option is surely less affordable than the second one, but you won’t have to take care of this task personally, hence there are no efforts on your part. Building a website yourself requires special skills and some experience, but what if you don’t have any of them? There are Do-It-Yourself solutions for people who’d like to setup and launch their own website without having any programming knowledge. One of these tools is Mobirise Website Design Software. There are a whole lot of free website builders that let even a newbie create websites. But the question is whether these websites are as functional and professional as websites made by web developers or not? The core criteria for modern websites is their “responsiveness”. Responsive website is a website that easily accommodates each and every device screen automatically. This means you don’t have to create desktop and mobile versions of your website separately. 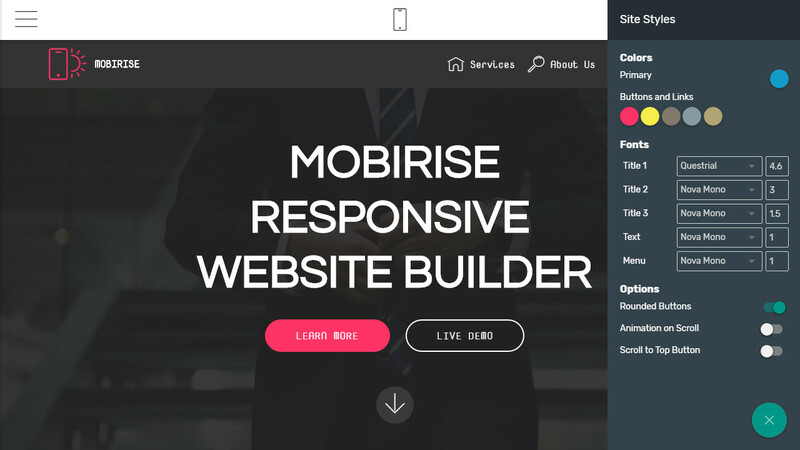 In this case Mobirise Responsive Website Builder allows you to build responsive and mobile-friendly websites as fast and easily as possible. It won’t be hard or time-consuming for you to acquaint yourself with Mobirise Mobile Website Builder. 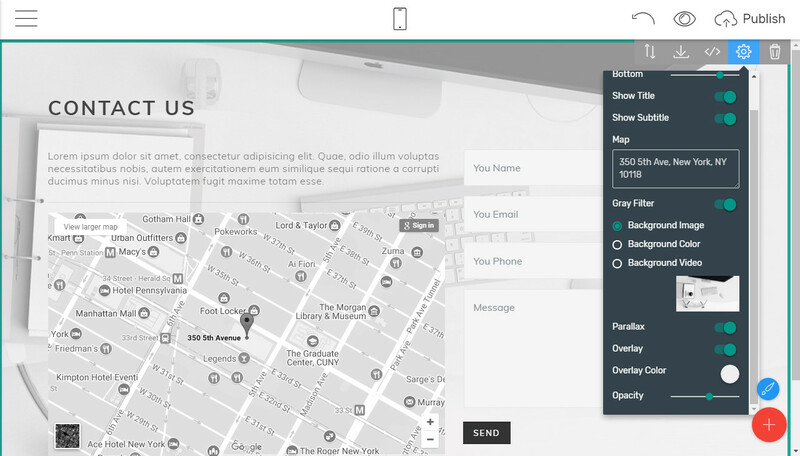 Mobirise is a easy website builder software. There are no subscription plans or expiring trials, so you can just download and install it to get started. To begin with, you open the website design software, go to “Sites” and click on “Create New Site”. Then you just drag website blocks from the right side panel and place them on your page. With the help of block parameters you design the picked website blocks as you desire. You can insert or type some text and embed images and videos just in a few clicks. The design work is done and you need to publish your website. Just click on the “Publish” button and your website will be exported wherever you want: to your local drive, to your server via FTP or to Github Pages. As you see, it doesn’t take you much time and effort to create a simple yet responsive website. As one of the upsides of Mobirise Free Website Builder is that it’s based on Bootstrap, one of the most reputable web development frameworks. Bootstrap allows you to create a structure for your website which makes it mobile-friendly and responsive. In this case, Mobirise is an excellent ready solution for those who wants to have a Bootstrap-based website for free. Otherwise, you would have to spend weeks or months to learn Bootstrap in order to create a similar website like sites generated with Mobirise. Mobirise Drag and Drop Website Builder comes along with 4 free responsive website templates: Mobirise, Mobirise 3, Mobirise 4 and PurityM website themes. These templates contain ready pre-designed website blocks. You can easily customize these blocks to give your website an outstanding and unique look. Each block serves as a functional unit with a lot of features: solid and gradient menus with dropdowns, full-screen headers with video and image backgrounds, articles, retina-ready galleries and sliders, shop blocks with sorting features, pricing tables, animated counters and countdowns, testimonials with rounded picture frames, footers with reveal effects and more. Mobirise free web design software also offers other templates that have much more functionality. Websites made with all these themes are 100% mobile-friendly. 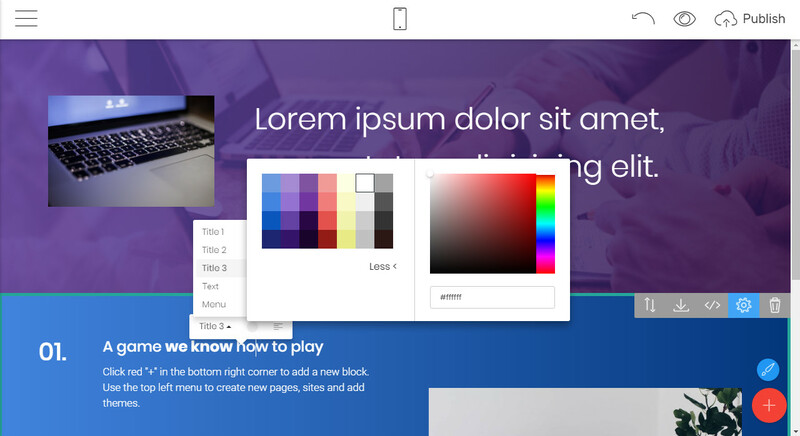 You can control without efforts how your website looks on other devices: you will find buttons for various view modes in the top of the Mobirise free web design software. Every offline website builder software has its pros and cons. But usually it depends on what users expect from these tools. 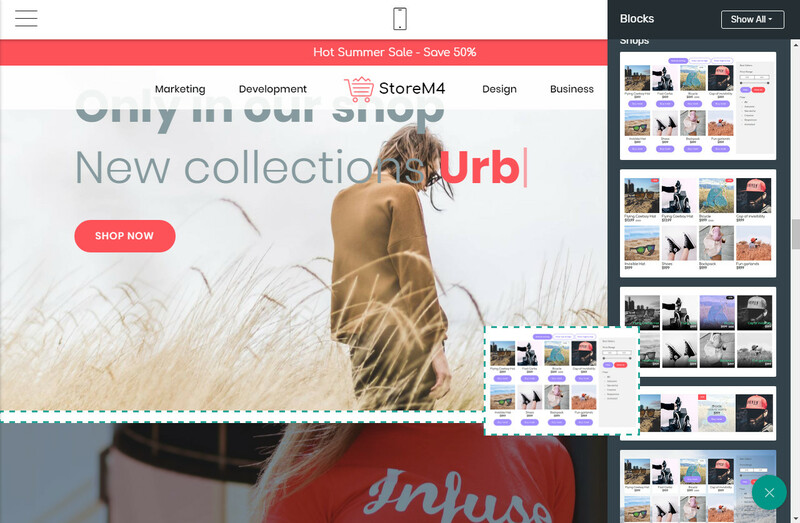 Mobirise is a free website builder. There are no upgrades and trials. You don’t have to purchase a license to create non-profit and commercial websites. There are no restrictions or limits in what kind of website you’re going to build using this free web design software. Mobirise is a responsive website builder. 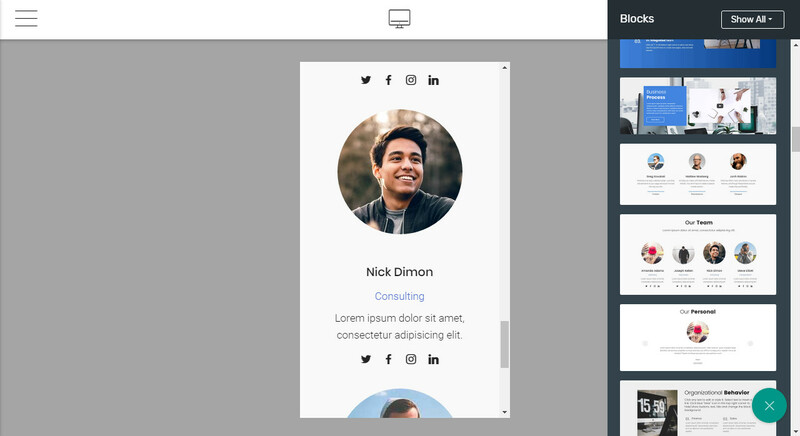 It’s never been that easy to create fully responsive sites with minimum input on your part. Regrettably, Mobirise generates only websites with blocks stacked on top of each other. If you want to have a simple landing page, it couldn’t be considered as a disadvantage. In some situations you realize you need more options to customize your website. But for these cases Mobirise offers the Code Editor extension. This extension allows you to edit HTML/CSS code of your website in the application, so you can forget about restrictions of the Mobirise options. Having a responsive website is a big advantage. It is a mark of a serious approach. Your website visitor would definitely think you have a good team of web designers behind all this. But in fact you profit from that you don’t have any team, you created your website for free using free web design software and it looks amazing in any browser and on any device. Thousands of users consider Mobirise Website Design Software as one of the best time and money-saving solutions. That’s why it’s worth a try. Download Website Design Software Now!